I love nail art but I’m terrible at doing it myself. I can usually do one hand pretty well but the other? Forget it. 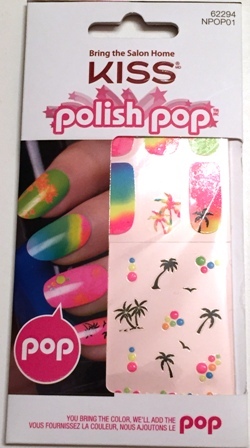 Luckily Kiss’ Polish Pop in Abbey Road lets me have my nail art without all the frustration. 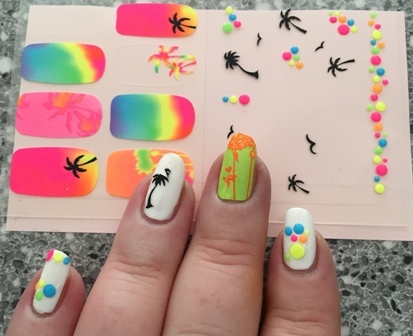 Each package comes with eight full-cover accent strips intended for an accent nail (or two) and a sheet of mini accents with birds, palm trees and neon bubbles. The smallest of the full cover strips were too big for my smallest nails but fit my middle finger perfectly. The smaller accents take a little practice and are easy to lift up to replace, just make sure your polish is completely dry before you apply them. I love how many options I get with this kit and that I can use it more than once. 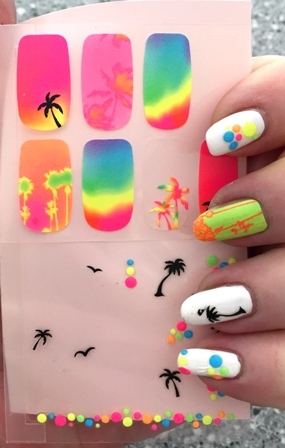 If you want fun nails for a music festival or a day at the beach or any time really, this is a great way to change up your nails.